New research showed that when participants took part in workplace and gym-based exercises they reported reduced neck pain (Chen). Office workers commonly complain of neck pain, which can range from mild to debilitating, and can also be accompanied by upper-back, shoulder and shoulder-blade (scapula) pain, as well as headaches. The pain may make you reluctant to exercise, but emerging research has shown regular workplace exercises can both prevent and reduce this pain (CHEN). For many years we have been told about the benefits of an ergonomic workplace, but newly published research has reinforced the importance of regular exercise. While sitting, office workers tend to lean forward or even slouch in their chair, and this static posture places stress on the back, neck, shoulders, arms and legs. The result is tight muscles and stiff joints that can turn everyday activities into a pain in the neck! While the pain is often felt in the neck it can be as a result of imbalance and tightness in other areas. Studies have shown that issues with the scapula, and the trapezius muscle (that large muscle that runs from your skull to your scapula and midway down your back) can all contribute. New research has shown that when participants took part in exercises at their workplace and general fitness training exercises, reported that their pain was reduced (Chen). Your mum was right when she told you to sit up straight. Simple exercises can help to both prevent and alleviate this pain. Try this simple one now: Sit in your chair with both feet flat on the floor -Pay attention to your lower back, is it arched? Tuck your pelvis under to maintain neutral position – now focus on your breast bone (Sternum), think about having it lifted – lastly tuck your chin in to give yourself that horrid double chin! Then keeping this position lift your head while maintaining this chin tuck, relaxing into a resting position. This is the correct sitting position for sitting activities such as computer and deskwork, how do you feel while you sit in this position? 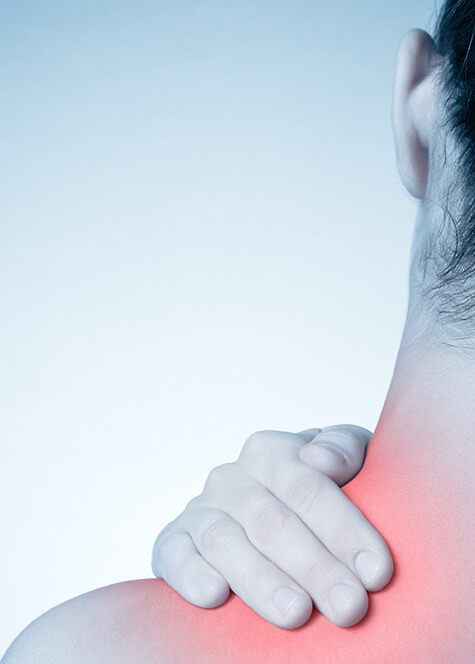 If you would like to know more about addressing your neck and shoulder pain, visit with one of our AMS Physiotherapists. The Physio’s at AMS are experts in identifying postural, neck and shoulder issues relating to the workplace, and will provide you with a stretching and strengthening program for at home and at work. Make an appointment today! Stop suffering from neck and shoulder pain and get started with your neck and shoulder treatment today and get the correct exercises prescribed for you by one of our AMS Physiotherapists today!